During the months following FDR’s third inauguration on 1/20/1941, the war in Europe spread. Hitler broke his non-aggression pact with Stalin and attacked the Soviet Union in the summer. FDR asked Congress to renew the draft for another year, and it passed by one vote over the opposition of America Firsters who opposed American entry into the war. In a famous speech, Pres. Roosevelt outlined the Four Freedoms in a speech to Congress on 1/6/1941: freedom of speech, freedom of religion, freedom from want, and freedom from fear. Much of the opposition to American involvement in the war disappeared when the Japanese fleet attacked Pearl Harbor. On the same day, Japan destroyed two British warships near Singapore. President Roosevelt appeared before Congress, decried the attack on 12/7/1941 as a day which would live in infamy, and asked for a declaration of war against Japan. Congress voted to declare war against Japan that very day. Germany and Italy responded by declaring war on the United States, so on 12/11/1941 Congress declared war on these two nations as well. Japanese admiral Yamamoto feared the American industrial capability, but few Americans save FDR were aware of the possibilities. 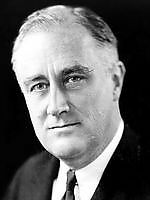 FDR proposed that Congress authorize spending for over 150,000 airplanes; 120,000 tanks; 50,000 antiaircraft guns; and additional battleships and aircraft carriers. His critics saw his numbers as unrealistic, and the Allied defeats during 1942 in Africa and Asia tended to strengthen their case. The strength of the opposition was tested in the midterm elections; the Republicans gained ten U.S. Senate seats and 47 U.S. House seats. The new breakdown in the House was 222–209 in favor of the Democrats. As the American industrial complex was converted into a military complex, the Axis powers were unable to sustain their early wins. The Allies pushed the Germans out of northern Africa in 1943, the Soviet troops lifted the siege of Stalingrad the same year, and the American forces took the offensive against Japan. By the time the nominating conventions met in 1944, the Axis powers were retreating from France in western Europe. The Republican contenders were quickly weeded out in 1944. Willkie endorsed many of Roosevelt’s war programs, which eliminated him from the running. Thomas E. Dewey had been elected Governor of New York in 1942 and assumed the role of front runner. His opposition included Gov. Harold E. Stassen MN, Gov. John W. Bricker OH, and Gen. Douglas MacArthur WI. The only primary of importance was held in Wisconsin, where Dewey placed first, followed by MacArthur, Stassen, and then Willkie. At the convention, Dewey received the votes of all of the delegates save one. The convention nominated Gov. Bricker for VP. Although President Roosevelt had no active opponent for the Democratic nomination, some disgruntled Democrats hoped to have a hearing at the National Convention. In particular, the South felt slighted following the repeal of the two-thirds rule, as the promised addition of bonus delegates was not enacted. The Convention corrected the oversight and adopted a bonus measure, which helped to ease the anti-FDR sentiment. Only 90 delegates bothered to vote against him on the roll call. The vice presidential roll call was another matter. The disgruntled Southern delegates had already decided not to support Wallace, which satisfied many of the Democratic leaders of some northern states who were aware of FDR’s failing health and preferred not to see Henry Wallace as president. On the first ballot, Wallace led with 36.5% to 27% for U.S. Senator Harry S Truman of Missouri. Truman chaired a Senate committee which was responsible for the elimination of waste in military spending. 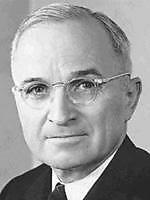 On the second ballot, Truman took the lead with 41% to Wallace’s 40%, and states began to shift their votes to Truman until he had the 88% of the delegate votes. Thomas E. Dewey conducted a spirited campaign against FDR. He went on a whistlestop tour of the nation; after a speech and a press conference, Dewey met with the local Republican candidates and always began his interview with them with the words, “Well, I’m here to learn what your problems are.” Dewey’s campaign was impressive to the media, but he trailed FDR badly. Dewey chose not to use the greatest issue which he possessed. He learned that the American military had learned to decode the Japanese diplomatic and military messages, and that a message that the Japanese were planning an attack on Pearl Harbor had been decoded. Dewey wisely realized that the use of this dramatic piece of information would sabotage the war effort, as even in 1944 the military was reading the coded messages of the Axis powers. On election day, President Roosevelt won a fourth term by a 53–46% margin. His electoral vote margin was 432–89; the largest state to support Dewey was Ohio (thanks to Gov. Bricker’s presence on the ticket). The Democrats also rebounded in Congress, taking nineteen U.S. House seats from the Republicans.